Courts • At a gathering expected to draw 10,000 near Heber, a camp trailer becomes a courtroom. 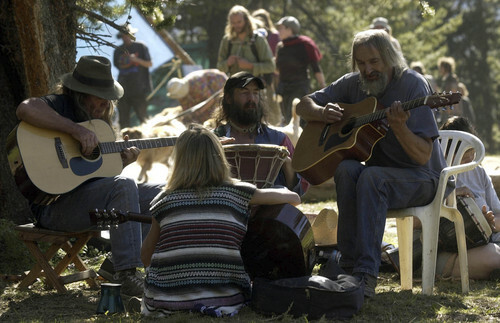 As befits an event that&apos;s been held annually for more than four decades, the Rainbow Family Gathering is steeped in tradition: the chanting of "Om" before a meal, the prayer for world peace on the morning of the Fourth of July and, of course, the mandatory court appearance. So it was that on Thursday morning, 17 members of the Rainbow Family of Living Light appeared in a camp trailer-turned-courtroom that was as makeshift and temporary as the gathering itself. Hearings for misdemeanor citations issued by federal agencies usually are heard in federal courts in Utah&apos;s larger cities such as Salt Lake City, St. George and Moab, said Melodie Rydalch, a spokeswoman for the U.S. Attorney&apos;s Office in Utah. But rather than forcing both U.S. Forest Service rangers and Rainbow Family members to leave the gathering to go appear in federal court two hours away in Salt Lake City, the court came to them. "It&apos;s more efficient to have court up there," Rydalch said. The marshals, prosecutors and public defenders all rode out to the gathering site 15 miles east of Heber. U.S. Magistrate Judge Dustin Pead even wore his black robes. Forest Service law enforcement officers have issued 21 citations for minor offenses  eight for marijuana possession, three for motor vehicle violations, two for off-leash dogs and one for possession of fireworks, among others  since the gathering kicked off in the Uintah National Forest two weeks ago. Forest Service spokeswoman Kim Osborn said that law enforcement and Rainbow Family members have mostly avoided confrontation at this year&apos;s gathering. Still, Osborn said, the gathering has not been free of tension. "Law enforcement is out there working, and some people like law enforcement and some don&apos;t, whether they&apos;re doing anything wrong or not," Osborn said. "So you&apos;re going to have positive and negative attitudes towards that." Karin Zirk has been going to the gathering for 25 years and said the mobile courts are an annual occurrence. She said many in the Rainbow Gathering resent the perceived harassment for relatively minor offenses from law enforcement officers. "Sometimes I feel like the Forest Service law enforcement are trying to provide a show of strength in the hopes that they&apos;re going to intimidate people," Zirk said. "But that doesn&apos;t really fly well in a group of counterculture people. I don&apos;t know how well it flies anywhere, but I can totally tell you it doesn&apos;t fly well in this community." In more than two decades of attending the Rainbow Gathering, Zirk has found that Forest Service law enforcement officers are more effective when they tread lightly. In 2011, for example, officers policing the gathering in Washington State were successful by adopting a more reserved strategy. "They didn&apos;t come in on this big power trip," Zirk said. "They just came in to see how they could be of service to U.S. citizens using their national forest. It was really nice and really mellow, and we had no problems whatsoever." Zirk, who lives in San Diego, plans to get to the gathering over the weekend. She will join more than 2,000 people who were already camped at the site as of Friday morning, according to the Forest Service. At least another 8,000 are expected to arrive by next Thursday. While most of the family has remained peaceful, one woman was arrested last week and charged on suspicion of attempted murder after she allegedly stabbed a man in the head and shoulder. The woman, nicknamed "Hitler," may face additional charges for allegedly assaulting someone with a tire iron. And on Thursday, police arrested a 24-year-old man from New Jersey who was attending the gathering on suspicion of trying to steal a woman&apos;s purse outside a Heber City Walgreens. Judge Pead dismissed four cases Thursday, some because the state has outstanding felony warrants on the individuals, Rydalch noted. Those not sentenced to jail or paying fines were sentenced to community service, the Forest Service said in a press release. They will spend a combined 60 hours picking up trash, cleaning dispersed campgrounds and cleaning fire pits in the national forest. Trials, to be held at the gathering, were set in three cases. One will be July 1 before U.S. Magistrate Paul Warner. The other trials will be on July 7. Three people did not appear for Thursday&apos;s hearings, and arrest warrants were being issued.